The brain is a mass of nerve tissue located in an animal's head that controls the body's functions. In simple animals, the brain functions like a switchboard, picking up signals from sense organs and passing the information to muscles. In more advanced animals, particularly vertebrates, the brain is much more complex and is capable of far more advanced behaviors. The brain is part of an animal's central nervous system, which receives and transmits impulses. It works with the peripheral nervous system, which carries impulses to and from the brain and spinal cord via nerves that run throughout the body. Blood-brain barrier: A modification of capillaries in the brain stem that prevent certain chemicals from entering the brain through the bloodstream. Broca's area: An area in the cerebrum that organizes thought and coordinates muscles for speech. Ganglion: A structure comprised of nerve cell bodies, usually located outside the central nervous system. 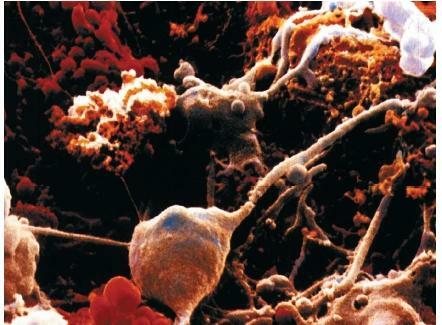 Glial cells: Nerve cells (other than neurons) located in the brain that protect, support, and assist neurons. Neuron: A type of nerve cell. Stimulus: Anything that incites an organism to action, such as light, sound, or moisture. Wernicke's area: An area in the cerebrum that processes information from written and spoken language. The simplest brains are those found in invertebrates, animals that lack a backbone. For example, roundworms have a simple brain and nervous system consisting of approximately 300 nerve cells, or neurons. Sensory neurons located in the head end of the animal detect stimuli from the environment and pass messages to the brain. The brain then sends out impulses through a nerve cord to muscles, which respond to the stimulus. The way that neurons in the brain process the data received determines the response made by the animal. Somewhat more advanced organisms have more complex nervous systems. A key component of such systems are ganglia, masses of neurons that can take in and process information. The brain of an earthworm, for example, consists of a pair of ganglia at the animal's head end. are analyzed. The central nervous system then transmits impulses along nerves that coordinate muscle action, causing the earthworm to move toward or away from the stimulus. Insect brain. In insects, specialized sense organs detect information from the environment and transmit it to the central nervous system. Such sense organs include simple and compound eyes, sound receptors on the thorax (the main body) or in the legs, and taste receptors. The brain of an insect consists of a ganglion in the head. Ganglia are also found in some segments of the insect's body. The information that insects use for behaviors such as walking, flying, mating, and stinging is stored in these segmental ganglia. In experiments in which heads are cut off of cockroaches and flies, these insects continue to learn. The central nervous system of vertebrates (animals with backbones) consists of a single spinal cord, which runs along the animal's back, and a highly developed brain. The brain is the dominant structure of the nervous system. It is the master controller of all body functions, and the analyzer and interpreter of complex information and behavior patterns. One can think of the brain as a powerful computer that uses nerve cells rather than silicon chips. The peripheral nervous system, composed of nerves which run to all parts of the body, transmits information to and from the central nervous system. The vertebrate brain is divided into three main divisions: the fore-brain, the midbrain, and the hindbrain. The hindbrain connects the brain to the spinal cord, and a portion of it, called the medulla oblongata, controls important body functions such as the breathing rate and the heart rate. Also located in the hindbrain is the cerebellum, which controls balance. The forebrain consists of the cerebrum, thalamus, and hypothalamus. Among its other functions, the forebrain controls the sense of smell in vertebrates. The midbrain is the location of the optic lobes, responsible for receiving and interpreting visual signals. The midbrain is also the source of an organism's motor responses. During the first few weeks of development, the brain of a vertebrate looks like a series of bulges in the tube of nerve cells. There is very little difference among early brains of fish, amphibians, reptiles, birds, and mammals. As the brain develops, however, the bulges enlarge. Each type of vertebrate acquires its own specific adult brain that helps it survive in its environment. In the forebrain of fish, for example, the olfactory (smell) sense is well developed, whereas the cerebrum serves merely as a relay station for impulses. In mammals, on the other hand, the olfactory division is included in the system that also controls emotions, and the cerebrum is highly developed, operating as a complex processing center for information. Optic lobes are well developed in the midbrain of nonmammalian vertebrates, whereas in mammals the vision centers are mainly in the forebrain. In addition, a bird's cerebellum is large compared to the rest of its brain, since it controls coordination and balance in flying. process, and transmit impulses, while glial cells (neuroglia) protect, support, and assist neurons. The brain is protected by the skull and by three membranes called the meninges. The outermost membrane is known as the dura mater; the middle as the arachnoid; and the innermost as the pia mater. Also protecting the brain is cerebrospinal fluid, a liquid that circulates between the arachnoid and pia mater. Many bright red arteries and bluish veins on the surface of the brain penetrate inward. Glucose, oxygen, and certain ions pass easily from the blood into the brain, whereas other substances, such as antibiotics, do not. Capillary walls are believed to create a blood-brain barrier that protects the brain from a number of biochemicals circulating in the blood. The parts of the brain can be studied in terms of structure and function. Four principal sections of the human brain are the brain stem (the hindbrain and midbrain), the diencephalon, the cerebrum, and the cerebellum. The brain stem. The brain stem is the stalk of the brain, and is a continuation of the spinal cord. It consists of the medulla oblongata, pons, and midbrain. The medulla oblongata is actually a portion of the spinal cord that extends into the brain. All messages that are transmitted between the brain and spinal cord pass through the medulla. Nerves on the right side of the medulla cross to the left side of the brain, and those on the left cross to the right. The result of this arrangement is that each side of the brain controls the opposite side of the body. Three vital centers in the medulla control heartbeat, rate of breathing, and diameter of the blood vessels. Centers that help coordinate swallowing, vomiting, hiccuping, coughing, and sneezing are also located in the medulla. A region within the medulla helps to maintain the conscious state. The pons (meaning "bridge") conducts messages between the spinal cord and the rest of the brain, and between the different parts of the brain. The midbrain conveys impulses from the cerebral cortex to the pons and spinal cord. It also contains visual and audio reflex centers involving the movement of eyeballs and head. Twelve pairs of cranial nerves originate in the underside of the brain, mostly from the brain stem. They leave the skull through openings and extend as peripheral nerves to their destinations. Cranial nerves include the olfactory nerve that brings messages about smell from the nose and the optic nerve that conducts visual information from the eyes. 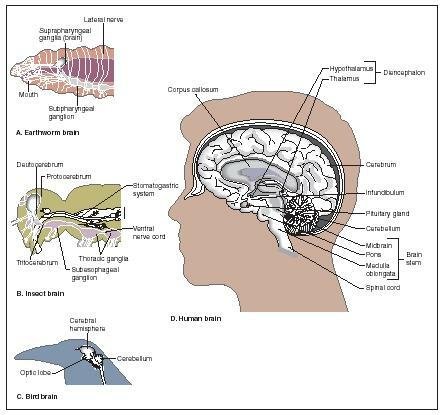 The diencephalon. The diencephalon lies above the brain stem, and includes the thalamus and hypothalamus. The thalamus is an important relay station for sensory information coming to the cerebral cortex from other parts of the brain. The thalamus also interprets sensations of pain, pressure, temperature, and touch, and is concerned with some of our emotions and memory. It receives information from the environment in the form of sound, smell, and taste. The hypothalamus performs numerous important functions. These include the control of the autonomic nervous system. The autonomic nervous system is a branch of the nervous system involved with control of a number of body functions, such as heart rate and digestion. The hypothalamus helps regulate the endocrine system (which produces hormones, chemical messengers that regulate body functions) and controls normal body temperature. It tells us when we are hungry, full, and thirsty. It helps regulate sleep and wakefulness, and is involved when we feel angry and aggressive. The cerebrum. The cerebrum makes up about 80 percent of the brain's weight. It lies above the diencephalon. The cerebral cortex is the outer layer of the brain and is made up of a material known as gray matter, consisting of many nerve cell bodies. The tissue of the cerebral cortex is about 0.08 to 0.16 inches (2 to 4 millimeters) thick, and if spread out would have a surface area of about 5 square feet (1.5 square meters), about one-half the size of an office desk. White matter, composed of nerve fibers covered with a fatty-like coating known as myelin sheaths, lies beneath the gray matter. A deep fissure separates the cerebrum into a left and right hemisphere (halves). Each cerebral hemisphere is divided into regions known as frontal, temporal, parietal, and occipital lobes. The corpus callosum, a large bundle of fibers, connects the two cerebral hemispheres. The cerebral cortex is the portion of the brain that provides the most important distinctions between humans and other animals. It is responsible for the vast majority of functions that define what we mean by "being human." It enables us not only to receive and interpret all kinds of sensory information, such as color, odor, taste, and sound, but also to remember, analyze, interpret, make decisions, and perform a host of other "higher" brain functions. By studying animals and humans who have suffered damage to the cerebral cortex, scientists have found that various parts of this region have specific functions. For example, spoken and written language are transmitted to a part of the cerebrum called Wernicke's area, where meaning is extracted. Instructions are then sent to Broca's area, which controls the movement of muscles throughout the body. Within Broca's area, thoughts are translated into speech and muscles are coordinated for speaking. Impulses from other motor areas direct our hand muscles when we write and our eye muscles when we scan the page for information. Association areas of the cerebrum are concerned with emotions and intellectual processes, by connecting sensory and motor functions. In our association areas, innumerable impulses are processed that result in memory, emotions, judgment, personality, and intelligence. One of the most fascinating of all brain functions is memory. Memory refers to the brain's ability to recall events that have taken place at some time in the past. Scientists have learned that two kinds of memory exist, short-term and long-term memory. They believe that the way in which these two kinds of memory function are somewhat different from each other. People who have a condition known as retrograde amnesia, for example, lose the ability to remember events that occurred immediately before some kind of shock, such as a blow to the head. Yet, they can easily remember events that occurred days, weeks, months or years before that shock. Scientists are still uncertain as to how the brain remembers things. They use the term memory trace to describe changes in the brain that correspond to the creation of memory. But no one really knows exactly what a memory trace corresponds to in terms of brain structure, chemistry, or function. According to the most popular current theory of memory, exposure to stimuli can cause changes in the connections that neurons make with each other. These changes may be the "memory traces" that scientists talk about. Those neural connections appear to be able to survive for very long periods of time and can be recalled when a person decides to recall them or when some stimulus causes them to reappear. Some exciting research on memory has suggested that nerve cells may actually grow and change as they are exposed to light, sounds, chemicals, and other stimuli. The new patterns they form may in some way be connected to the development of a memory trace in the brain. Two surprisingly small areas at the front of the cerebrum, located on each hemisphere roughly above the outer edge of the eyebrow, are the brain's centers for high-level thinking. In 2000, scientists announced that this paired region, called the lateral prefrontal cortex, was activated in people who were given tests involving verbal and spatial problems. This is the same region of the brain that previous research studies had shown to be important for solving novel tasks, keeping many things in mind at once, and screening out irrelevant or unimportant information. Scientists also believe the lateral prefrontal cortex acts as a global workspace for organizing and coordinating information and carrying it back to other parts of the brain as needed. Certain structures in the cerebrum and diencephalon make up the limbic system. These regions are responsible for memory and emotions, and are associated with pain and pleasure. By studying patients whose corpus callosum had been destroyed, scientists have learned that differences exist between the left and right sides of the cerebral cortex. The left side of the brain functions mainly in speech, logic, writing, and arithmetic. The right side of the brain, on the other hand, is more concerned with imagination, art, symbols, and spatial relations. The cerebellum. The cerebellum is located below the cerebrum and behind the brain stem, and is shaped like a butterfly. The "wings" are the cerebellar hemispheres, and each consists of lobes that have distinct grooves or fissures. The cerebellum controls the movements of our muscular system needed for balance, posture, and maintaining posture. As with any other part of the body, the brain is subject to a variety of disfunctions and disorders. Four of the most common of these are coma, epilepsy, migraine, and stroke. Coma. The term coma comes from the Greek word koma , meaning "deep sleep." Medically, coma is a state of extreme unresponsiveness in which an individual exhibits no voluntary movement or behavior. In a deep coma, stimuli, even painful stimuli, are unable to effect any response. Normal reflexes may be lost. The term coma is used for a side variety of conditions ranging from drowsiness or numbness at the least extreme to brain death at the worst extreme. Coma is the result of something that interferes with the functioning of the cerebral cortex and/or the functioning of the structures that make up the reticular activating system (RAS). The RAS is a network of structures (including the brain stem, the medulla, and the thalamus) that work together to control a person's tendency to remain awake and alert. A large number of conditions can result in coma, including damage to the brain itself, such as brain tumors, infections, and head injuries. They may also involve changes in the way the brain functions, such as a decrease in the availability of substances necessary for appropriate brain functioning, such as oxygen, glucose, and sodium; the presence of certain substances disrupting the functioning of neurons, such as drugs or alcohol in toxic (poisonous) quantities; or changes in the levels of certain essential brain chemicals due to seizures. The two hemispheres of the human brain are not created equal. Scientists have suspected for centuries that each hemisphere of the brain has specialized functions. As early as the 1860s, French physician Paul Broca (1824–1880) showed that patients with speech problems had damage to the left side of their brains. Additional research on split-brain functions later came from many other sources. For example, some patients with severe epilepsy have had the corpus callosum in their brain severed to relieve their discomfort. This surgery has, as a by-product, produced information on the way the two hemispheres function. A simpler way to study the two hemispheres is simply to protect one hemisphere from receiving information, such as placing a card over one eye, covering one ear, or providing sensory inputs to only one hand, arm, or foot. As a result of studies of this kind, scientists have been able to assign certain types of function to one hemisphere of the brain or the other. Perhaps the most obvious of these functions is handedness. In general, about 90 percent of all humans are right-handed, a characteristic that can now be traced to the control of that function in the left hemisphere of most human brains. Scientists now believe that language functions, such as the ability to speak, read, name objects, and understand spoken language are a function of the left hemisphere. The left hemisphere is also thought to be responsible for numerical and analytical skills. In contrast, the right hemisphere in most humans is thought to control non-verbal activities, such as the ability to draw and copy geometric figures, various musical abilities, visual-spatial reasoning and memory, and the recognition of form using vision and touch. There is also evidence that the two hemispheres of the brain process information differently. It seems that the right hemisphere tends to process information in a more simultaneous manner, processing and bringing diverse pieces of information together. The left hemisphere seems to process information in a logical and sequential manner, proceeding in a more step-by-step manner than the right hemisphere. In terms of emotions, there are some very intriguing findings. Some of these findings come from studies of individuals who showed uncontrollable laughter or crying. This evidence suggests that the left hemisphere is highly involved in the expression of positive emotions, while the right hemisphere is highly involved in the expression of negative emotions. Some researchers believe that the two hemispheres of the brain usually inhibit each other so that there is a balance, making uncontrollable emotional outbursts rare. The ultimate results of coma depend on a number of factors. In general, it is extremely important for a physician to determine quickly the cause of a coma, so that potentially reversible conditions are treated immediately. For example, an infection may be treated with antibiotics, a brain tumor may be removed, brain swelling from an injury can be reduced with certain medications. Outcome from a coma depends on its cause and duration. In drug poisonings, for example, extremely high rates of recovery can be expected, following prompt medical attention. Patients who have suffered head injuries tend to do better than patients whose coma was caused by other types of medical illnesses. Excluding drug poisoning-induced comas, only about 15 percent of patients who remain in a coma for more than a few hours make a good recovery. Adult patients who remain in a coma for more than four weeks have almost no chance of regaining their previous level of functioning. However, children and young adults have regained functioning after even two months in a coma. Epilepsy. The term epilepsy is derived from the Greek word for seizure. It describes a condition marked by irregularities in the body's electrical rhythms and is characterized by convulsive attacks (violent involuntary muscle contractions) during which a person may lose consciousness. The outward signs of epilepsy may range from only a slight smacking of the lips or staring into space to a generalized convulsion. It is a condition that can affect anyone, from the very young to adults, of both sexes and any race. Epilepsy was first described by the Greek physician Hippocrates, known as the father of medicine, who lived in the late fifth century B.C. The number of people who have epilepsy is not known. Some authorities say that up to one-half of 1 percent of the population are epileptic. But other experts believe this estimate to be too low. Many cases of epilepsy, those with very subtle symptoms, are not reported. The cause of epilepsy remains unknown. However, scientists are often able to determine the area of the brain that is affected by the manner in which the condition is demonstrated. For example, Jacksonian seizures, which are localized twitching of muscles, originate in the frontal lobe of the brain in the motor cortex. A localized numbness or tingling indicates an origin in the parietal lobe on the side of the brain in the sensory cortex. The recurrent (repeated) symptoms associated with epilepsy, then, are the result of unusually large electrical discharges from neurons in a particular region of the brain. These discharges can be seen on the standard brain test called the electroencephalogram (EEG). For this test, electrodes (devices that conduct electrical current) are applied to specific areas of the head to pick up the electrical waves generated by the brain. If the patient experiences an epileptic episode while he or she is wired to the EEG, the abnormal brain waves can easily be seen and the determination made as to their origin in the brain. If the patient is not experiencing a seizure, however, abnormalities will usually not be found in the EEG. Perhaps the best known examples of epilepsy known to the general public are grand mal and petit mal. The term mal comes from the French word of "illness," while grand and petit refer respectively to "large" and "small" episodes of the illness. In the case of grand mal, an epileptic is likely to have some indication that a seizure is imminent immediately prior to the seizure. This feeling is called an aura. Very soon after feeling the aura, the person will lapse into unconsciousness and experience generalized muscle contractions that may distort the body position. The thrashing movements of the limbs that follow in a short time are caused by opposing sets of muscles alternating in contractions. The person may also lose control of the bladder and/or bowels. When the seizures cease, usually after three to five minutes, the person may remain unconscious for up to half an hour. Upon awakening, the person may not remember having had a seizure and may be confused for a time. In contrast to the drama of the grand mal seizure, the petit mal may seem insignificant. The person interrupts whatever he or she is doing and for up to about 30 seconds may show subtle outward signs, such as blinking of the eyes, staring into space, or pausing in conversation. After the seizure has ended, the person resumes his or her previous activity, usually totally unaware of the interruption that took place. Petit mal seizures are associated with heredity, and they never occur in people over the age of 20 years. Oddly, though the seizures may occur several times a day, they do so in most cases when the person is quiet and not during periods of activity. After puberty these seizures may disappear or they may be replaced by the grand mal type of seizure. Treatment. A number of drugs are available for the treatment of epilepsy. The oldest is phenobarbital, which has the unfortunate side effect of being addictive. Other drugs currently on the market are less addictive, but all have the possibility of causing unpleasant side effects such as drowsiness or nausea or dizziness. The epileptic person needs to be protected from injuring himself or herself during an attack. For the person having a petit mal seizure, little usually needs to be done. Occasionally these individuals may lose their balance and need to be helped to the ground to avoid hitting their head. Otherwise, they need little attention. The individual in a grand mal seizure should not be restrained, but may need to have some help to avoid striking his or her limbs or head on the floor or any nearby objects. If possible, the person should be rolled to one side. This action will maintain an open airway for the person to breathe by allowing the tongue to fall to one side. Epilepsy is a recurrent, lifelong condition that must be managed on a long-term basis. Medication can control seizures in a substantial percentage of people, perhaps up to 85 percent of those with grand mal manifestations. Some people will experience seizures even with maximum dosages of medication. These individuals need to wear an identification bracelet to let others know of their condition. Epilepsy is not a reflection of insanity or mental retardation in any way. In fact, many who experience petit mal seizures are of above-average intelligence. Migraine. Migraine is a particularly severe form of headache. It was first described during the Mesopotamian era, about 3000 B.C. Migraine is a complex condition that is still poorly understood. The term does not apply to a single medical condition, but is applied to a variety of symptoms that are often numerous and changeable. Migraine sufferers find that their headaches are provoked by a particular stimulus, such as stress, loud noises, missed meals, or eating particular foods such as chocolate or red wine. A migraine condition can generally be divided into four distinct phases. The first phase is known as the prodrome. Symptoms develop slowly over a 24-hour period preceding the onset of the headache, and often include feelings of heightened or dulled perception, irritability or withdrawal, cravings for certain foods, and other features. The second phase, known as the aura, features visual disturbances that may be described as flashing lights, shimmering zig-zag lines, spotty vision, and other disturbances in one or both eyes. Other sensory symptoms may occur as well, such as pins and needles or numbness in the hands. All of these symptoms can be acutely distressing to the patient. This phase usually precedes the onset of headache by one hour or less. Phase three consists of the headache itself, usually described as severe, often with a throbbing or pulsating quality. The pain may occur on one or both sides of the head, and may be accompanied by nausea and vomiting and intolerance of light (photophobia), noise (phonophobia), or movement. This phase may last from 4 to 72 hours. During the final phase, called the postdrome, the person often feels drained and washed-out. This feeling generally subsides within 24 hours. Migraines appear to involve changes in the patterns of blood circulation and of nerve transmissions in the brain. Scientists currently believe that migraines develop in three phases. The first step takes place in the midbrain. For reasons not fully understood, cells that are otherwise functioning normally in this region begin sending abnormal electrical signals along their projections to other brain centers, including the visual cortex. The second step is activation of the blood vessels in the brain, wherein arteries may contract or dilate (expand). The third step is activation of nerve cells that control the sensation of pain in the head and face. Some patients may experience only one of these three stages. This fact could explain individuals who experience only the aura, without the pain phase, for example. Some recent research suggests a connection between migraine and levels of serotonin, a neurotransmitter found in the brain and numerous other cells and tissues. Migraine attacks have been correlated with falling levels of serotonin in the body. The connection has been strengthened by the observation that the drug sumatriptan, which closely resembles serotonin chemically, is highly effective in treating migraine. Stroke. Stroke is a medical condition characterized by the sudden loss of consciousness, sensation, and voluntary movement caused by the loss of blood flow to the brain. Stroke is also called a cerebral vascular accident or CVA. It is caused by one of two events, a ruptured artery or an artery that has become closed off because a blood clot has lodged in it. Stroke resulting from a burst blood vessel is called a hemorrhagic stroke, while one caused by a clot is called a thrombotic stroke. Blood circulation to the area of the brain served by that artery stops at the point of disturbance, and brain tissue beyond that point is damaged by the lack of oxygen and begins to die. Stroke is the third leading cause of death in the United States after heart attack and all forms of cancer. Approximately 500,000 strokes, new and recurrent, are reported each year. Of these, about 150,000 will be fatal. Today approximately 3,000,000 Americans who have had a stroke are alive. How a stroke occurs. The brain requires a constant and steady flow of blood in order to carry out its functions. Blood delivers the oxygen and nutrients needed by the brain cells. If this blood flow is interrupted for any period of time and for any reason, brain cells begin to die quickly. A burst blood vessel may occur in a weak area in the artery, or a blood vessel that becomes plugged by a floating blood clot. In either case, blood is no longer supplied to brain tissue beyond the point of the occurrence. The effect of the interruption in circulation to the brain depends upon the area of the brain that is involved. Interruption of a small blood vessel may result in a speech impediment or difficulty in hearing or an unsteady gait. If a larger blood vessel is involved, the result may be total paralysis of one side of the body. Damage to the right hemisphere of the brain results in disruption of function on the left side of the body, and vice versa. The onset of the stroke may be so sudden and severe that the patient is literally struck down in his tracks. Some patients have early warnings that a stroke may be developing, however. People who are known to form blood clots in their circulatory system can be given medications to prevent it. Also, current therapy includes medications that can be given to dissolve clots, thereby removing the barrier to blood flow. If blood flow can be reinstated quickly enough, brain tissue may suffer less damage—and less function may be lost. Strokes can be prevented by effective treatment of high blood pressure and by taking an aspirin tablet every day, for those who can tolerate such medication. The aspirin helps to prevent clot formation, and a number of clinical trials have shown it to be effective in stroke reduction. Very interesting work and research, but have we the technology to go further in to the brain, to be able to map its advanced state, to find limits and paramiters, to be able to find errors or faults within the human brain mapping structure. This is in aid of helping people like me, that has been born with part damage and shock part memory loss. So we can identify what that person needs to focus on, or develop within its understanding and connection. The electronic, chemical mechanics of connection or linkage of understanding to map and identify break down in circuitery! very interesting study about human brain, human brain is more complex and defrerent from animal brain. i am very interested.